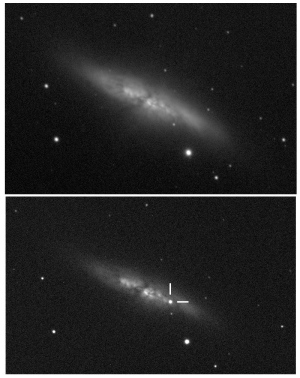 Last night, light from a new supernova reached astronomers on Earth. Its origin: the nearby galaxy M82, some 3.5 megaparsecs away (11.4 million light years). It is one of the closest and brightest supernovae seen from Earth since a monster exploded in 1987 just 168,000 light years away. 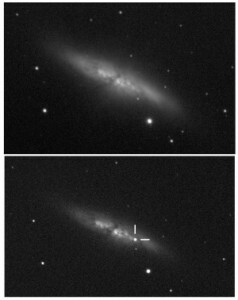 Astronomers say that the latest supernova is of the type 1a class, and may help reveal how such supernovae form. Moreover, because these supernovae are used as cosmic measuring sticks, understanding them better may help clarify the shape of the Universe.